1…Ka4 2.Ne4! Qxb6 3.Nc5+ Ka5 4.Ra3+ Kb5 5.Rb5 +-. 2.Rc6? Qa1+ 3.Kf2 Qd4(Qf6)+ =. 4…Qd8 5.Rc8 Qxd6 6.b8Q +-. 5.Rc3+? Kb2! (but not 5…Qxc3? 6.Nb5+, fork, +-) 6.Rc8 Qf4+ 7.Kg2 Qg4+ =. 6.Rc3? Qxc3! 7.b8Q Qxc4 =. 7.Na5? 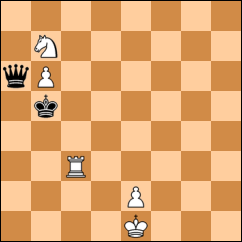 Qf4(Qf8)+ 8.Ke1 Qb4+ 9.Rd2 Qh4+ 10,Kd1 Qa4(Qh1)+ 12.Kc1 Qc4+ 13.Nxc4 – stalemate..
8…Qxb7 9.Ra3+ Kb1 10.Rb3+! Qxb3 12.Nd2+, fork, win.